Baby Rattles designed by Kate Finn are so soft and easy for baby to grab with soothing satin ribbons and sweet hand stitched faces. 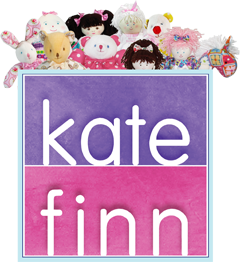 Kate Finn is now creating short animated stories about “The Finnies” featuring Kate Finn Rag Dolls and Baby Toys like our cute Baby Rattles. These short stories have been beautifully crafted to keep little ones enchanted by the gorgeous graphics and sweet characters. Episodes are available to download from Kate Finn’s YouTube Channel so you can keep little ones entertained for hours! The fabrics are colorful with interesting patterns to attract newborn eyes and every toy is soft and cuddly. Because of their unsurpassed quality these products last for years and are often handed down through families, although many children form such an attachment to their favorite toy that they refuse to part with it. We are quite used to getting an SOS from a desperate parent when a much loved Kate Finn toy has been lost.